A unique aspect of the Earth Institute at Columbia University is its commitment to engage directly in problem solving, namely the development and implementation of sustainable solutions to the many interlinked environmental and development challenges facing society. As a center within the Earth Institute, CIESIN has the opportunity to work at the interfaces between science and policy, basic and applied disciplines, and research and “practice.” When complex environmental and socioeconomic systems intersect, for example, we must often meld diverse sources and types of data into integrated data and information systems and products that meet the needs not only of researchers, but also of applied users and decision makers. And for these efforts to be effective and sustainable in the long run, we need to engage with such users on an ongoing basis to improve the utility of these systems and products and to incorporate new data, knowledge, and technology as they become available. 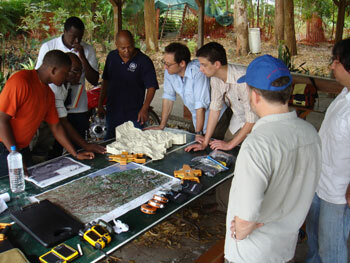 Partners from the Earth Institute and UNEP refer to a topographical model of the watershed under study to explain objectives of the Haiti Regeneration Initiative to local Haitians. The Earth Institute has long recognized that its deep involvement in policy and practice needs to be reconciled with the academic traditions and standards of a major research University such as Columbia. With this in mind, the Earth Institute Faculty established a Practice Committee, led by Professor Edward Lloyd of the Columbia Law School, which has endeavored to address a range of important practice-related issues faced by faculty, staff, and students, and by centers like CIESIN. This committee, on which I continue to serve, has discovered that different fields—e.g., law, public health, engineering, architecture and urban planning, and the arts and sciences—often have quite different approaches to recognizing the value of practice and to ensuring that high standards of quality in practice are met. 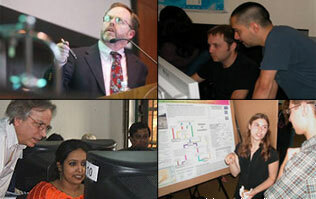 Clockwise from upper left, CIESIN staff and interns at different phases of the educational spectrum: lecturing; learning; presenting student research findings; and leading an internationally-hosted workshop. An important accomplishment of the Practice Committee in the past year was therefore the development of a new set of promotion criteria and associated procedures for professional officers of research in the Earth Institute, which have now been approved by the Earth Institute Faculty and, most significantly, by the Provost of Columbia University. These criteria allow centers like CIESIN to define important practical accomplishments and outputs, in addition to traditional peer-reviewed scientific publications, that can be used to assess the quality and productivity of our staff. Thus, CIESIN scientists who produce unique problem-oriented interdisciplinary data sets, or who help develop innovative online visualization or analysis tools, or who spend months or years in the field helping to implement integrated development or ecological management approaches, or who support international assessments like the Intergovernmental Panel on Climate Change (IPCC) may now receive formal recognition for this work along with their more traditional scientific research outputs. Such recognition is vital if CIESIN is to retain innovative and dedicated scientific staff, and help the Earth Institute achieve its goals of utilizing the best science and data available in support of sustainable development. Many students are also increasingly interested in gaining practical experience in conjunction with their coursework or to meet program or career goals. But their direct involvement in practice efforts comes with a number of challenges, not only in terms of their own learning experience, but also their overall impact on “clients”—whether poor farmers in developing countries, small businesses in New York, or disaster managers and first responders in hazardous regions. CIESIN, and the Earth Institute more broadly, has a responsibility to ensure that its education and training efforts have positive impacts, both short- and long term, on those whom we and the students are trying to help. This is one of the topics that the Practice Committee is now addressing. 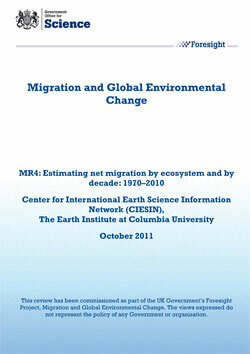 As part of this benchmark report on environmental migration, CIESIN completed a modeling effort on net migration by ecosystem and by decade for the past 40 years. In looking ahead towards an expanded role for CIESIN in practice both at the Earth Institute and in many of our national and international initiatives, I see some growing challenges. For example, since the Haiti earthquake in 2010, CIESIN has been playing a leadership role in ecological restoration and development in southwestern Haiti—requiring our staff to travel and work in dangerous locations, deal with rapidly changing political, socioeconomic, and health conditions, and coordinate diverse efforts by national and international government agencies, nongovernmental and private voluntary organizations, community groups, donors, and both local and international academic institutions. In our efforts in support of the Millennium Villages Project, we must balance the need for better information and metrics in assessing and improving progress towards the Millennium Development Goals against the need to protect the confidentiality and other rights of individuals, households, and communities. Since sustainable development by definition requires a long-term perspective, ensuring appropriate capacity building and sharing of expertise and data with users in the field is essential. CIESIN will also continue maintaining a sensible balance between its research, practice, and educational activities, since these are often very complementary and mutually beneficial. CIESIN remains strongly committed to research on important scientific questions on the interactions between humans and the environment, in areas such as climate vulnerability and adaptation, disaster risk management, environment and security, urbanization and land use change, and emerging diseases. In an era of both rapid population and environmental change, new research and data results often have immediate policy applications and implications for applied users around the world. Appropriate and effective use of this research and data requires training practitioners and educating new generations of students to deal with these challenging interdisciplinary problems. New information technologies can improve access to needed data and information more rapidly and at lower cost, and enable both public- and private-sector decision makers to improve the use of science in sustainable development. 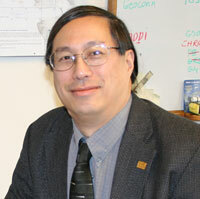 Over the next few years, CIESIN plans to continue strengthening its role in practice, expanding its ability to reach users via the Internet and working directly with key decision makers and supporting the development of networks such as the Global Earth Observing System of Systems (GEOSS). Such efforts will help ensure that the unique resources and expertise of the academic world are made accessible and usable to those who most need them.